Everyone I talk to agrees: We are having one of the best autumns ever for color! 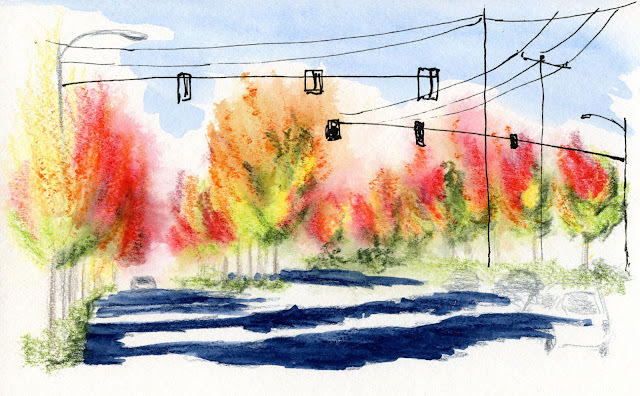 On my way to the pumpkin carving party last Friday, I missed my turn to the community center because I was so dazzled by the fiery maples near Northgate Mall. I don’t know enough about maples to identify their varieties, but unlike the ones I saw the other day at University Village, which were all bright yellow-orange, these displayed a full range of green, yellow, orange, red and magenta. By the time I left the party, the sun had dipped below the buildings, so the trees were no longer blazing. I returned the next day to catch them in the late afternoon sun, and those maples were once again afire. A couple days later I followed a tip from a friend (thanks, Katie!) to a tree near Green Lake. Expecting to see a maple when I arrived at the intersection she gave me, I was surprised to find another type of tree: spectacularly red in the mid-afternoon sun and dripping strands of yellow-green pod-like buds. After doing my usual “research” (a social media call to my tree-knowledgeable friends), I learned that it’s a sourwood tree. (Actually, a pair of them stood right next to each other, but from the angle I sketched them, they looked like one.) Not only has this fall been a feast of eye candy; I’m also learning to identify trees new to me. 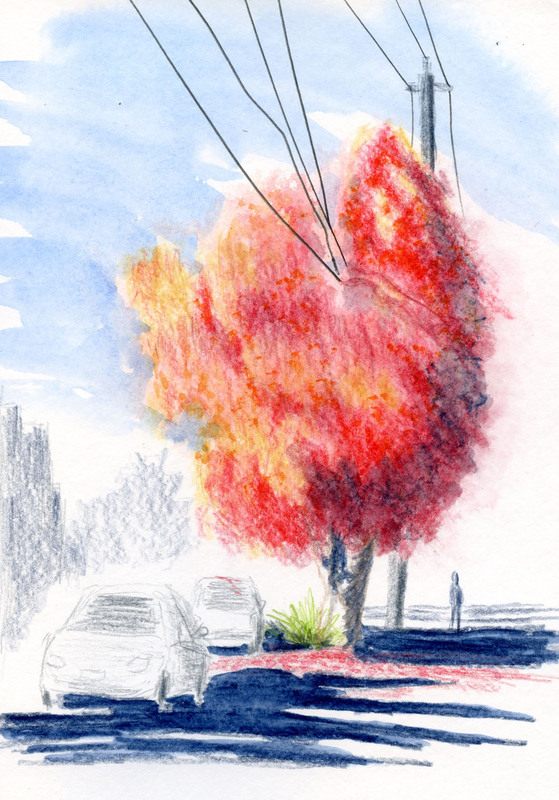 Especially with these color drawings, I am always struck by the immense beauty and perspective you capture. And your use of reds and related colors ... WOW! Thanks so much, George! After years of struggling with wimpy watercolors, I'm really happy to have figured out that colored pencils are more my game. Stay tuned. . . I have a demo planned for the sourwood tree sketch. You're right, Janine -- I didn't mean to say the paints themselves were wimpy -- I meant the results *I* got from my use of the paints! :-) And thank you! This sourwood tree is outstanding! I love the shape and the vibrancy and just for you it is embracing the wires! !